It has long been recognized that the forage quality of legumes, including clovers, is generally higher than that of most forage grasses. Legumes are usually higher in crude protein, digestibility and many minerals and vitamins. The legume forages are digested more rapidly than grasses. The result is better animal performance. The total yield of forage per acre from grass/legume mixtures is usually increased over grass alone. For example, studies conducted over many years at the University of Kentucky have shown that red clover grown with tall fescue produces a greater total forage yield than tall fescue fertilized with 180 lb/N/acre. Clovers can play an important role in offsetting various livestock disorders caused by other forages, especially forage grasses. In a recent survey in two southern states, "growing legumes with tall fescue" was found to be the number one strategy used by beef cow and calf producers to cope with the endophyte of tall fescue. Grass tetany is another animal disorder reduced or eliminated by the presence of clovers in animals' diets. The use of clovers in forage crops can have an enormous impact on the economics of pasturing grazing animals. Nutrition is generally recognized as the primary limiting factor on most livestock farms, and legumes usually provide higher nutrition levels than grasses. Better nutrition means more milk production, higher weaning weights, and increased likelihood of high reproductive efficiency. These factors positively impact gross income. Cover forages also help reduce expenses by lowering nitrogen fertilizer expense, which typically accounts for 20 to 40% of the cost of producing forage from grasses (and nitrogen prices have generally been on the increase since the early 1970's). 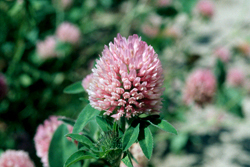 Clover seed usually costs $10 to $25 per acre depending on the seeding rate. Other costs associated with establishing clovers depend on the growing site, situation, and method of seeding, but are typically less than the seed costs. Often the value of nitrogen fixed by clovers will more than offset the cost of their establishment. Thus, the use of clovers in forage programs has dual benefits. When clovers are present, animal performance increases while expenses decreases. Clovers are truly sustainable plants. Research results, farmer experience, and many demonstrations have clearly shown clovers to be agronomically sound, environmentally friendly, and economically advantageous. Watch this video to learn more about improving your forage program with clover."